Compatible with the new NPTE-PTA Blueprint! HOW WERE THE QUESTIONS DEVELOPED IN THE STUDENT VERSION OF ONLINE ADVANTAGE? A diverse group of item writers contributed to the development of the student version of Online Advantage. Great care was taken to ensure there was adequate representation in each of the system (musculoskeletal, neuromuscular, cardiopulmonary, other) and non-system (equipment and devices, therapeutic modalities, safety and professional roles, teaching/learning, research) areas. Item writers were given explicit instructions including a training manual to ensure that submitted questions were consistent with the style and format of the questions utilized on the NPTE-PTA. Once created each examination was subjected to a minimum of three months of beta testing by physical therapist assistant students from academic programs throughout the United States. IS ONLINE ADVANTAGE DESIGNED TO BE CONSISTENT WITH THE RECENT CHANGES IN THE NATIONAL PHYSICAL THERAPIST ASSISTANT EXAMINATION? 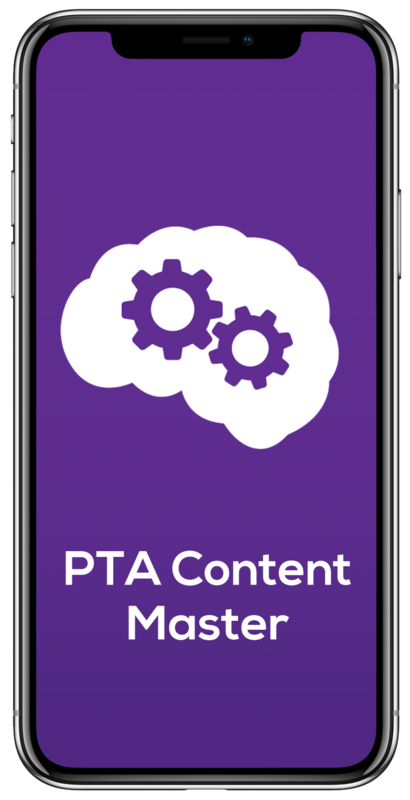 Our goal is to provide students with the most realistic testing experience possible in order to better prepare students for the NPTE-PTA. We closely monitor all communication about the NPTE-PTA from the Federation of State Boards of Physical Therapy and attempt to immediately integrate relevant changes into our products. 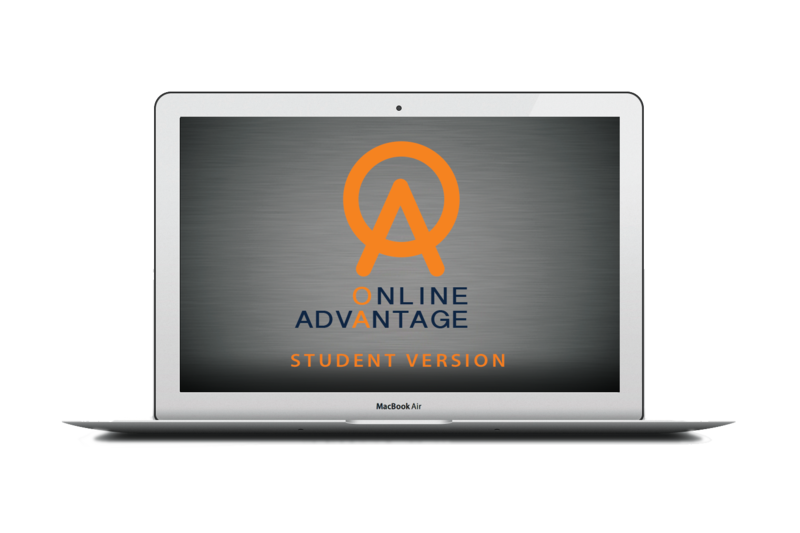 HOW MANY STUDENTS HAVE UTILIZED THE STUDENT VERSION OF ONLINE ADVANTAGE? To date over 10,000 students have utilized the student version of Online Advantage. This is important since the established mean score in each of the system specific and content outline areas is based on an extremely diverse group of students from academic programs throughout the United States. CAN ONLINE ADVANTAGE BE USED ON A VARIETY OF DEVICES? 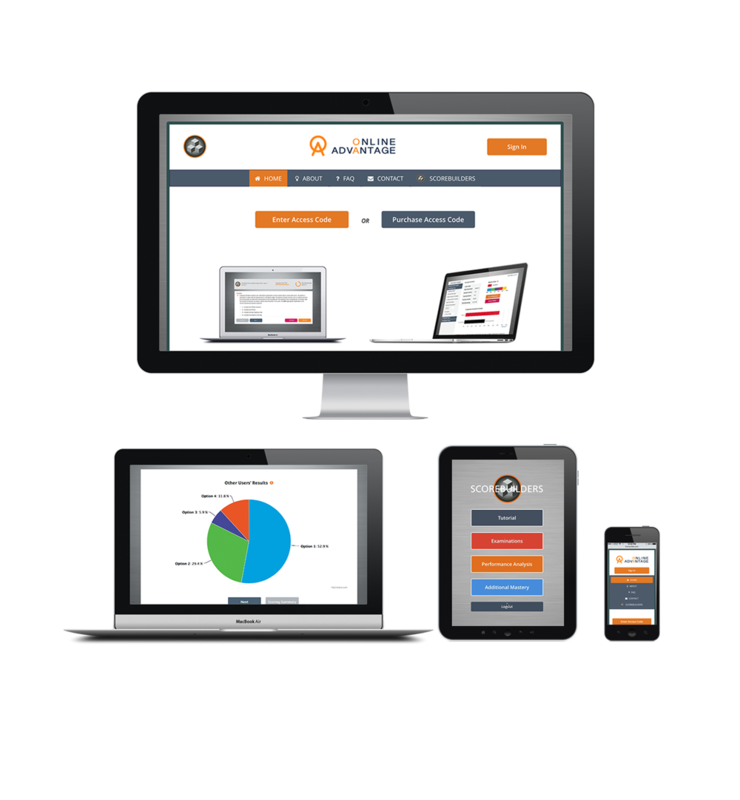 Online Advantage is fully scalable meaning that you can access the sample examinations on your personal computer, tablet or mobile device. Our goal was to create a product compatible with your busy lifestyle. WHAT METHODS CAN I USE TO PURCHASE THE STUDENT VERSION OF ONLINE ADVANTAGE? The student version of Online Advantage must be purchased through our web site www.scorebuilders.com using a credit card. HOW DO I ACCESS ONLINE ADVANTAGE? An ID and Password is generated upon purchase. If you encounter any difficulty during the purchasing process, simply call our office (866)PTEXAMS to receive assistance. The ID and Password can be entered on the Online Advantage web site www.ola-sb.com. There is not an established uniform "passing score" for the examinations since the circumstances in which students elect to take the examination are very different. For example, some students take the examination up to nine months prior to graduation, while others take the examinations after graduation. The most relevant factor to consider when deciding on the relative strength of an examination score is the mean examination score for all candidates. This number, which is constantly updated based on student performance, reflects the relative difficulty of the established examination. Ideally, a score of greater than or equal to the mean represents a strong score. Students' scores typically range from 82-128 or 55-85%. 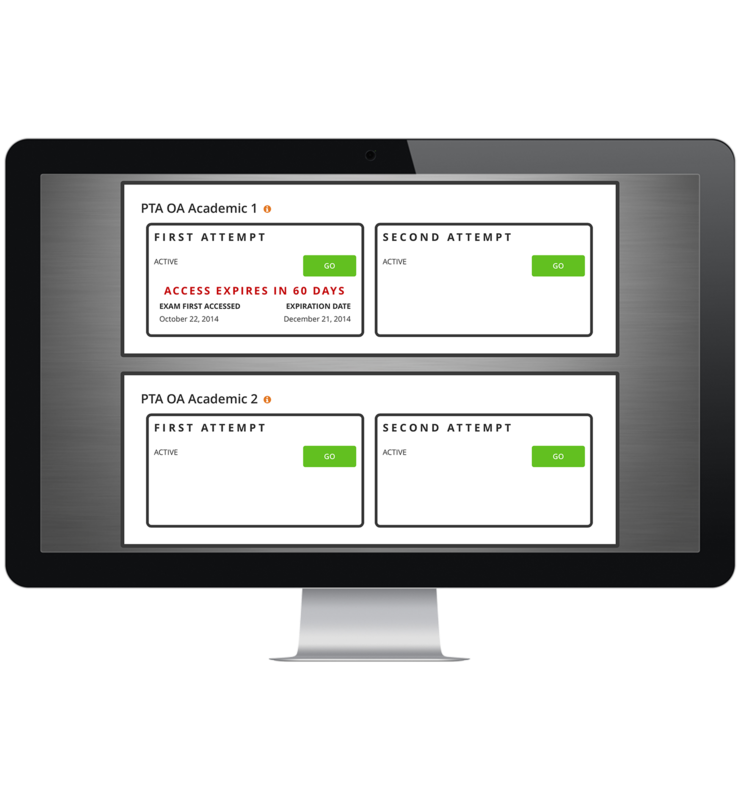 WHAT PERCENTAGE OF STUDENTS USING ONLINE ADVANTAGE PASS THE NATIONAL PHYSICAL THERAPIST ASSISTANT EXAMINATION ON THE FIRST ATTEMPT? Many academic programs anecdotally report a moderate to strong positive relationship between Online Advantage scores and NPTE-PTA scores. It is important to note, however, that students should avoid determining their readiness for the actual examination based on a single practice examination. Research presented at APTA's Combined Sections Meeting in Nashville, Tennessee revealed a .665 correlation between the Online Advantage score and the National Physical Therapist Assistant Examination scale score. In addition, a student who scores 110 on Online Advantage has a 95% chance to score 600 or greater on the NPTE-PTA. IS IT DESIRABLE FOR STUDENTS TO TAKE MORE THAN ONE ONLINE ADVANTAGE EXAMINATION? Many students will take one Online Advantage examination early in their preparation and another examination much closer to their actual examination date. The rationale is that the first examination serves as a pre-test to establish a baseline and identify areas requiring remediation. The second examination then serves as a post-test to determine the amount of progress and the relative degree of preparedness for the National Physical Therapist Assistant Examination. IS THERE A DISCOUNT OFFERED WHEN STUDENTS PURCHASE BOTH EXAMINATIONS AVAILABLE IN THE STUDENT VERSION OF ONLINE ADVANTAGE? Students can save $20 when the two examinations are purchased at the same time. The discounted price for the two examinations is $50. IF I PURCHASE BOTH EXAMINATIONS WILL I HAVE TO TAKE THE EXAMINATIONS WITHIN THE SAME 60-DAY PERIOD? The 60 day periods are independent of each other and will not begin until the student initiates each of the respective examinations. HOW LONG WILL STUDENTS HAVE TO ACCESS THEIR INDIVIDUAL DATA? Students will have access to their individual data for 60 days once they initiate taking the examination. Students can print their performance analysis summary at any point during that period and review both their first and second attempts throughout the course of the 60 days. IF THE 60 DAY PERIOD INADVERTENTLY EXPIRES, IS THERE ANY WAY TO GAIN ADDITIONAL ACCESS TO THE EXAMINATION? CAN STUDENTS TAKE AN EXAMINATION MORE THAN ONCE? Online Advantage permits students to take each examination a maximum of two times. Students should recognize that the second attempt is typically a poor measure of mastery since students have already been exposed to the questions. It is critical, however, for students to utilize the performance analysis section of Online Advantage multiple times in order to review correct and incorrect questions and to determine individual strengths and weaknesses. DO STUDENTS NEED TO TAKE THE EXAMINATION IN A SINGLE SITTING? Students are encouraged to take the examination in a single sitting since this most closely resembles the format utilized on the NPTE-PTA. It is possible, however, to exit the examination if necessary. When exiting Online Advantage all question data will be automatically preserved. CAN ONLINE ADVANTAGE ACCOMMODATE STUDENTS WITH DOCUMENTED LEARNING DISABILITIES? The time available for students to complete the 150 question examination is three hours. Students eligible for extended time (time and a half or double time) can easily be accommodated by calling our office (866)PTEXAMS. Online Advantage is compatible with several systems that magnify computer type for students that are visually impaired. I CANNOT FIND MY SCHOOL LISTED IN THE ONLINE ADVANTAGE LIST OF ACADEMIC PROGRAMS? If you are unable to find the name of your academic program on our menu, please contact our office 1-866-PTEXAMS. Online Advantage is designed to be an interactive web-based study tool and therefore does not permit students to print out the examination. The program allows students to print their performance analysis summary and have full online access to the examination questions and explanations an unlimited number of times within the 60-day period. DOES ONLINE ADVANTAGE OFFER AN EXPLANATION OF ANSWERS? 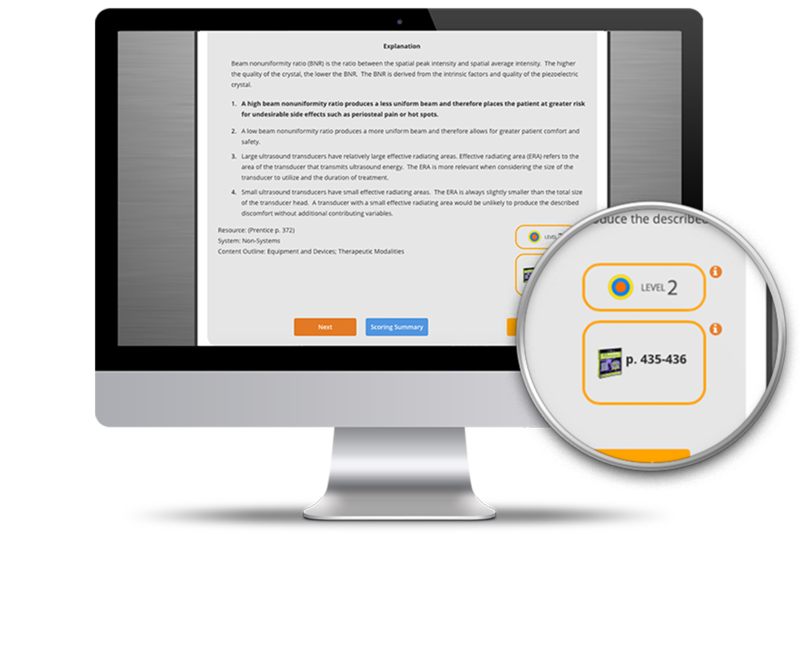 Each question in Online Advantage includes an explanation of the correct answer and an explanation for each incorrect answer including a cited resource with page number. Performance data for "all candidates" is based solely on data obtained from the students' first attempt. If students retake the same examination it is important to recognize that their ability to recall specific items from the examination will artificially inflate their actual score. As a result, the data from the second attempt is not utilized when determining summary data for "all candidates." CAN STUDENTS PURCHASE THE ACADEMIC VERSION OF ONLINE ADVANTAGE? Students are not permitted to purchase the academic version of Online Advantage. This restriction substantially reduces the potential of students being exposed to examination items in advance and increases the meaningfulness of obtained examination scores. MY ACADEMIC PROGRAM WILL BE USING THE ACADEMIC VERSION OF ONLINE ADVANTAGE AS A COMPREHENSIVE FINAL EXAMINATION. WOULD IT BE USEFUL TO PREPARE FOR THE EXAMINATION BY TAKING ONE OR MORE OF THE EXAMINATIONS FROM THE STUDENT VERSION OF ONLINE ADVANTAGE? Taking an examination from the student version of Online Advantage is an excellent method to prepare for the academic version. The rationale is that the first examination serves as a pre-test to establish a baseline and identify areas requiring remediation. 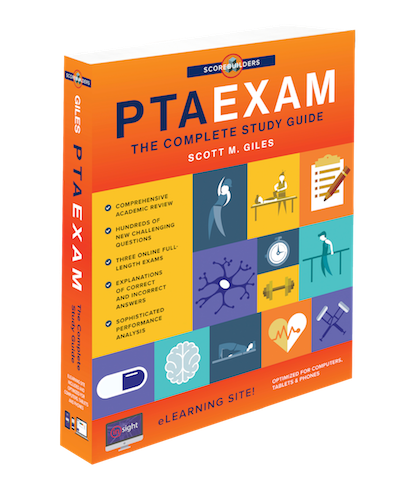 The second examination (i.e., academic version) then serves as a post-test to determine the amount of progress and the relative degree of preparedness for the NPTE-PTA. Students electing to adopt this strategy should make sure they leave ample time between the two examinations in order to engage in designated remediation activities. ARE THE QUESTIONS UTILIZED IN THE ACADEMIC VERSION OF ONLINE ADVANTAGE THE SAME AS THE QUESTIONS UTILIZED IN THE STUDENT VERSION? The academic and student versions of Online Advantage are completely distinctive products that utilize independent examination questions. The academic version consists of two examinations and is designed solely for the use of academic programs electing to offer a comprehensive examination to their graduating students. 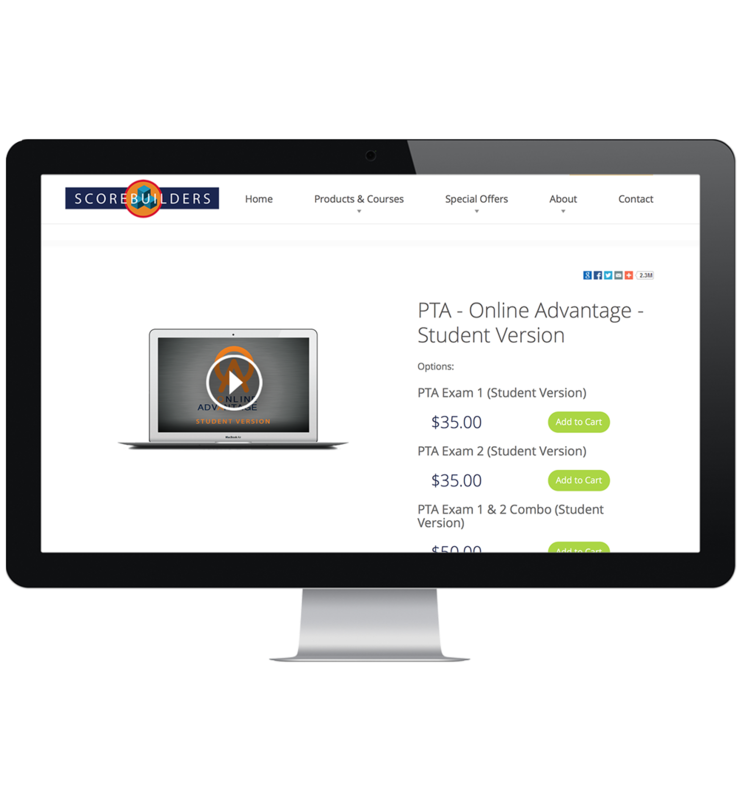 The student version of Online Advantage consists of two examinations and is designed to assist students with their preparation for a comprehensive examination or the NPTE-PTA. ARE THE QUESTIONS UTILIZED IN YOUR REVIEW BOOKS OR REVIEW COURSES THE SAME AS THE QUESTIONS UTILIZED IN THE STUDENT VERSION OF ONLINE ADVANTAGE? Each of our products utilize independent examination questions. DO THE QUESTIONS UTILIZED IN ONLINE ADVANTAGE CHANGE EACH YEAR? An item analysis is performed annually on each of the examinations. As part of the process selected items are removed and new questions are added. Items are also removed and added to make sure the questions remain consistent with changes in the examination content outline. On average 10-30 questions will be replaced annually in each of the examinations. DO THE EXAMINATIONS CONSIST OF 150 OR 200 QUESTIONS? The NPTE-PTA consists of 200 questions, offered in four sections of 50 questions. 150 of the examination questions are scored items, while 50 of the questions are pre-test items used for possible inclusion as scored items in a future examination. Since a student's maximum attainable score on the actual examination is 150, all Online Advantage examinations consist of 150 questions offered in three sections of 50 questions. IS ONLINE ADVANTAGE DESIGNED TO SERVE AS A WEB-BASED REVIEW COURSE? Online Advantage is a web-based comprehensive testing program and is not designed to serve as a review course. Our two-day On-Campus Review Course and our online review course ACE - A Competitive Edge allow students to explore all elements of preparing for the NPTE-PTA. In 2014, Scorebuilders offered over 200 review courses at many of the finest physical therapist and physical therapist assistant programs in the United States. Additional information on our review courses is available on our web site. Wow! My score report gave me a pretty clear picture of where I need to spend more time studying. My first Online Advantage exam made me nervous, but after tweaking my study tactics based on my score, my second exam score was MUCH better! Just a quick note to let you know how much I love the new Leaderboards! As you likely know, PT students can occasionally be competitive and although I am now only competing with myself, this type of data serves as a great source of motivation for me. Preparing for the exam is hard enough and any additional mojo is hugely appreciated! Seeing my score compared to everyone else's who has ever taken this online test really helped my confidence. Being well above the middle of the pack is a pretty comfortable place to sit as exam day gets closer! I absolutely love the explanation of answers in your resource. The breadth and depth far exceeded my expectations and they have served as an important resource for me when studying. My sample exam scores have been steadily trending upward and I am feeling very confident in my abilities to pass this exam! I cannot wait to be licensed! Thank you! Much more user friendly than going through and figuring it all out on my own. The results helped me tweak my study plan in some surprising areas that I would not have otherwise considered. Online Advantage is an invaluable resource. Not only did it give me a detailed score report to find my weak areas, but it gave me the opportunity to take more sample exams! I like having a reliable resource to use in getting the hang of computer based testing. Between this and the FSBPT resource I feel pretty sure that I won't be thrown off by any big curve balls on test day. Dare I say? I feel READY! Candidates can purchase a single full-length examination for $35 or two examinations for $50 ($20 Savings!). The examinations offer extremely challenging multiple-choice questions designed to simulate the actual examination. Watch your scores move up the Leaderboard! 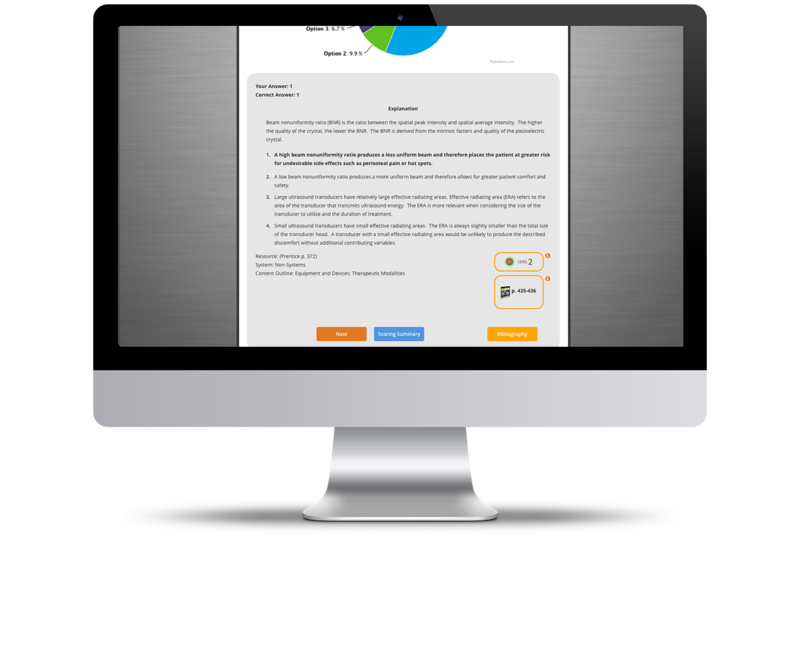 Compare your examination results to the scores of thousands of other licensing candidates. 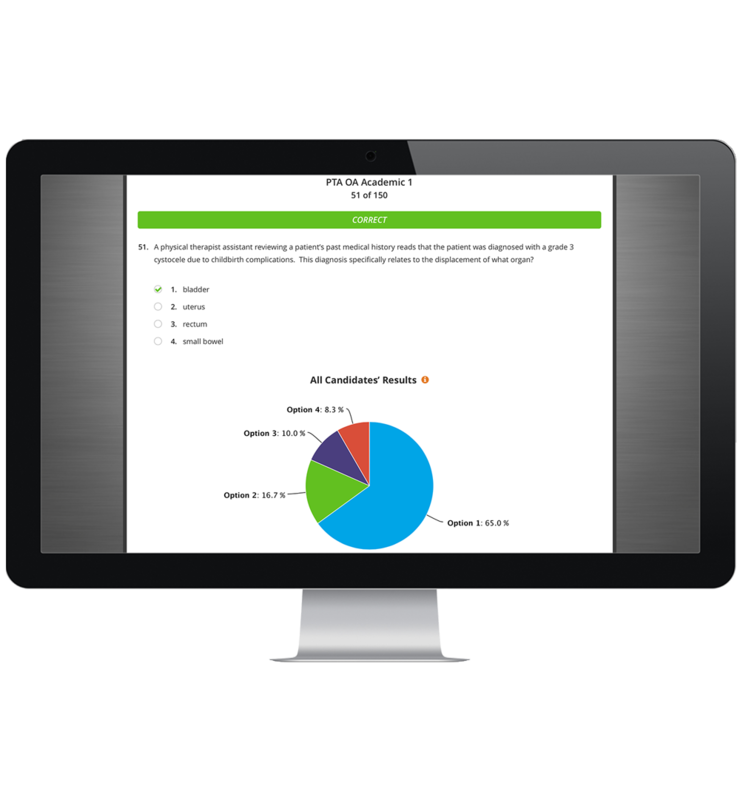 Online Advantage is fully scalable meaning that you can access the sample examinations on your personal computer, tablet or mobile device. 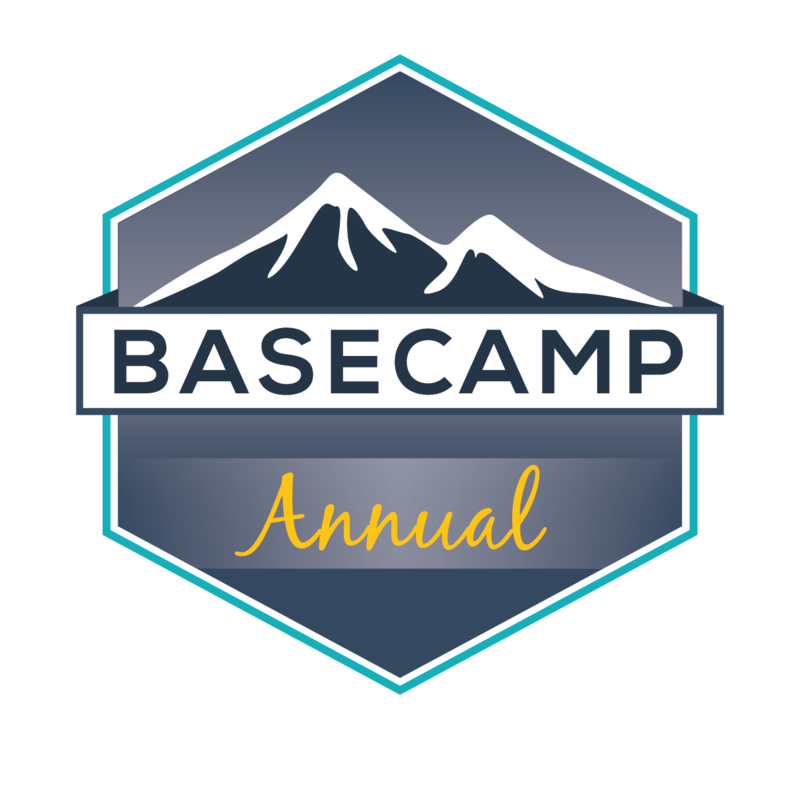 Our goal was to create a revolutionary testing site compatible with your busy lifestyle. Candidates receive an access code that permits entry to the examinations for a 60-day period. Candidates can take each examination two times and have unlimited access to the performance analysis section during the 60-day access period. Each examination consists of 150 multiple-choice questions designed to emphasize clinical decision making skills. Candidates take the examination using a web-based testing platform designed to simulate the actual National Physical Therapist Assistant Examination. 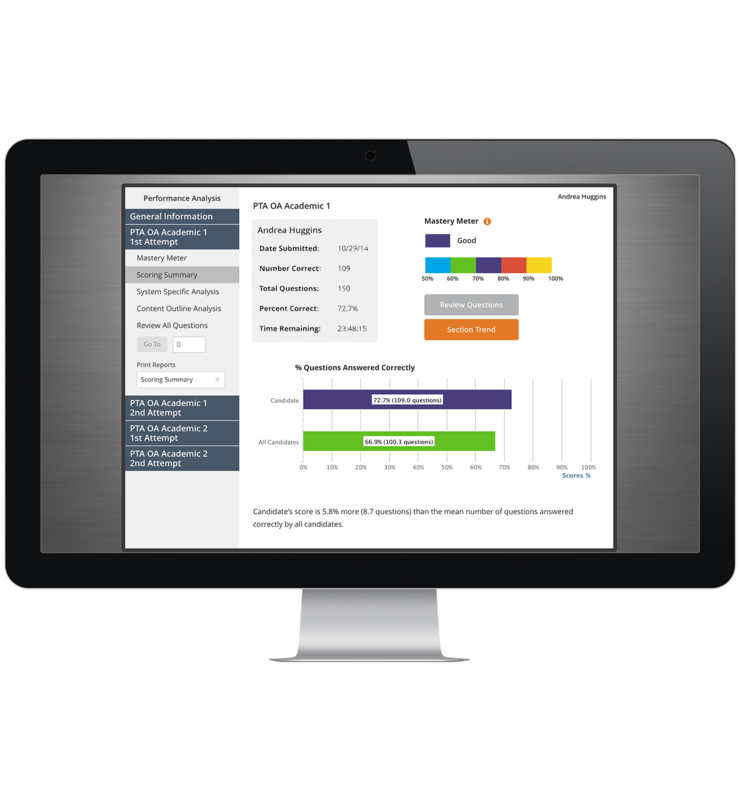 Online Advantage allows candidates to assess their current examination performance using a sophisticated performance analysis section. 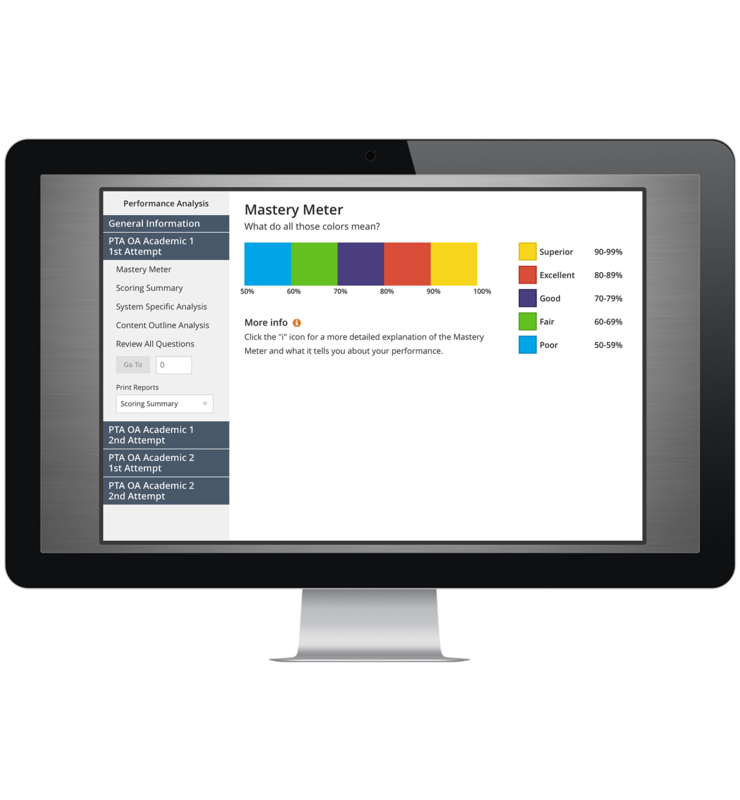 A Mastery Meter with labels ranging from “superior” to “poor” is used to classify a candidate’s performance. Online Advantage allows candidates to compare their examination scores to the mean score of all candidates that have taken the same examination. The mean score provides the most relevant information regarding the difficulty level of a given examination and is therefore critical when assessing student mastery. Online Advantage is a web-based application that collects data from every candidate who uses this resource. This allows us to report items such as the percentage of candidates answering each question correctly and the percentage of candidates that select each of the four possible options. Expansive explanations of the correct and incorrect options allow candidates to quickly identify essential academic content and improve decision making when selecting from good, better, and best options. Increase the efficiency of your study sessions! Use our new Academic Focus Area to target specific content in Scorebuilders’ best selling review book PTEXAM: The Complete Study Guide. The Content Outline Summary offers candidates the ability to analyze their examination performance in five unique content outline areas. In each area candidates can compare their performance to the mean score of all candidates that have taken the same examination. 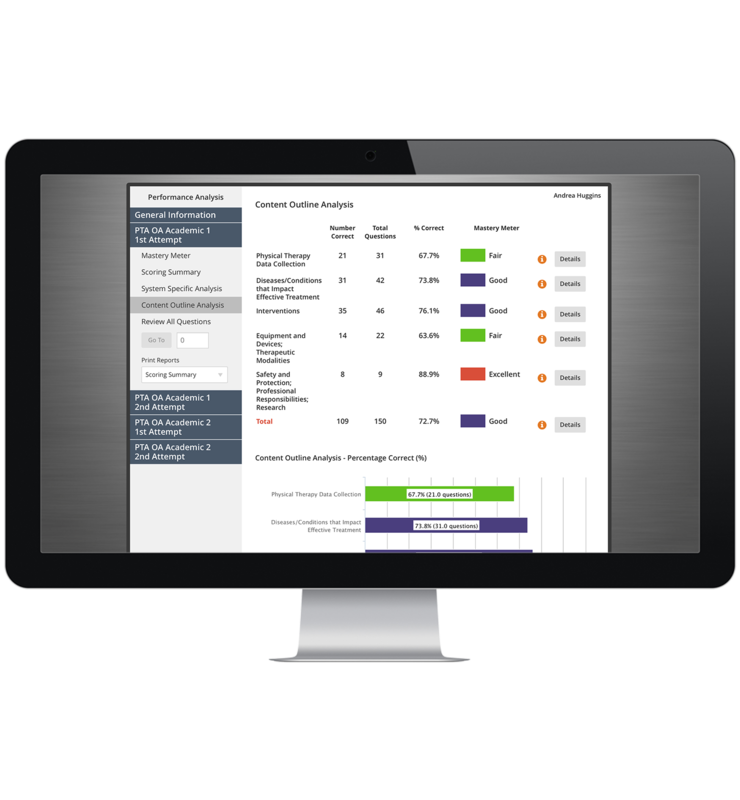 The System Specific Summary offers candidates the ability to analyze their examination performance in five different system areas. In each area candidates can compare their performance to the mean score of all candidates that have taken the same examination. An ideal test drive before the exam! The student version provides candidates with an ideal opportunity to assess their current examination performance relative to the performance of other examination candidates by using two online comprehensive examinations. Students can purchase an individual access code for each examination that permits entry to the student online comprehensive examination. Students can use the examinations to prepare for a comprehensive examination administered by their academic program and/or as a means of preparing for the National Physical Therapist Assistant Examination. Comprehensive summary reports identify areas of strength and weakness as well as offer specific suggestions for remedial activities. Visual assessment through the Mastery Meter. The Performance Analysis section does much more than just show you your overall score. It is designed to help you assess your performance on the exam and pinpoint any deficits so that you can make the best use of your available study time. Directly compare your examination performance with established data from other students. A sophisticated performance analysis section summarizes feedback in five system specific and content outline areas. 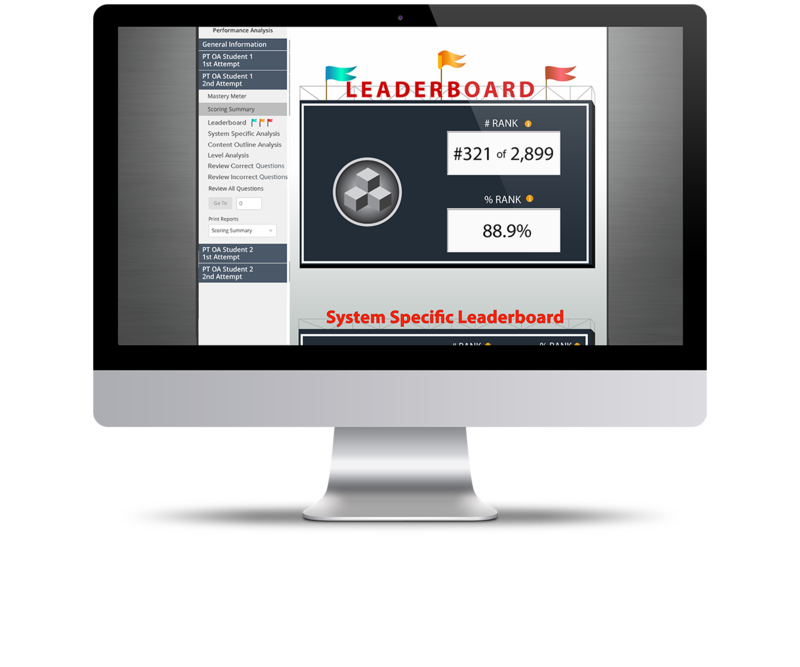 Comparison statistics are given for your overall score as well as your scores in each of the content and system areas.